Hello 2014! I’m kicking off the year with a sad thought. A few days ago I took down all my Christmas decorations and put them away. BOOO! I especially hate taking down the holiday cards that I had received all of December… aka proof that I got REAL mail. I love seeing the collection as it’s forming up on my holiday card wreath or the pile of envelopes in the mailbox each day. While many people have been sending the adorable photo cards, I hate to just throw away the remaining traditional store bought paper cards. Instead, at the end of every season, I choose to recycle them for next year! I collect all the cards and my selection of large punches and a hole punch. I move the punches around on the cards to find the best pieces and make little gift tags! Sometimes the whole front of the card is cute so I trim away to make a fun tag (like that dog one on the top left) and other times, I punch away to take the best part of the design. Next year, I’ll be all set to add my tags onto gifts with just a little bit of ribbon to attach! 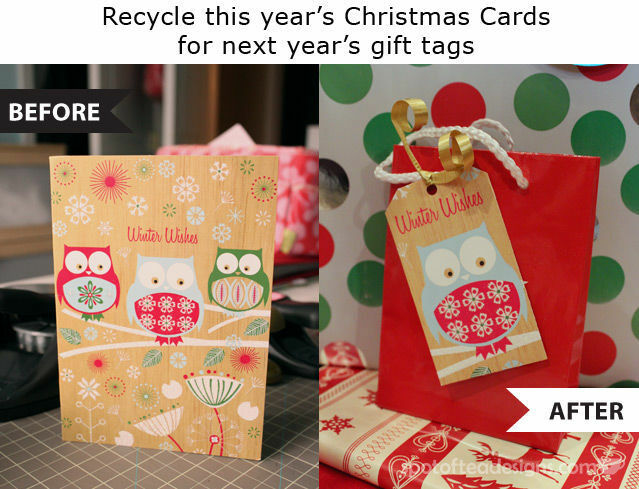 Why not take your left over cards, some holiday scraps and make some for your own unique gift tags for next season? !